Ok, I won’t speak about Buddhism here. Juzu is also a new framework for developing portlets (and standalone applications soon) very quickly. You can find all the information you need on the Juzu website. Now let’s create our first portlet with Juzu ! This creates a juzu project in a myapp folder. Before deploying the application, you need to build it. Simply run mvn clean package in the myapp folder. 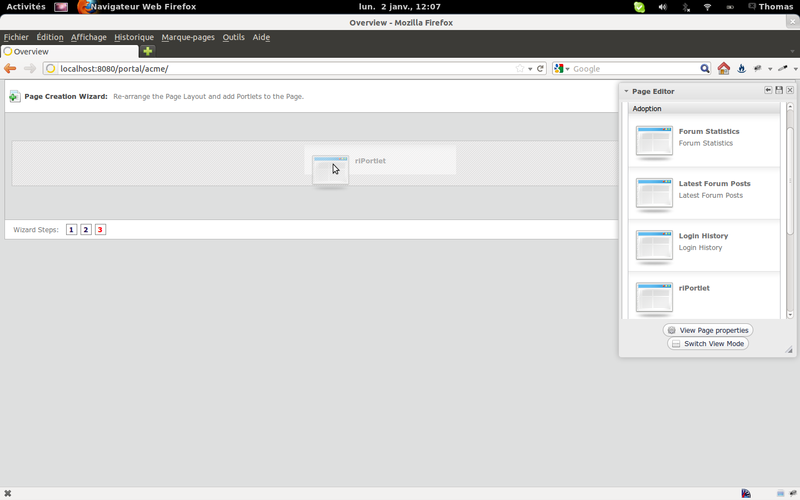 It will generate a myapp.war under your myapp/target folder. We are now ready to deploy the portlet in a portal container. 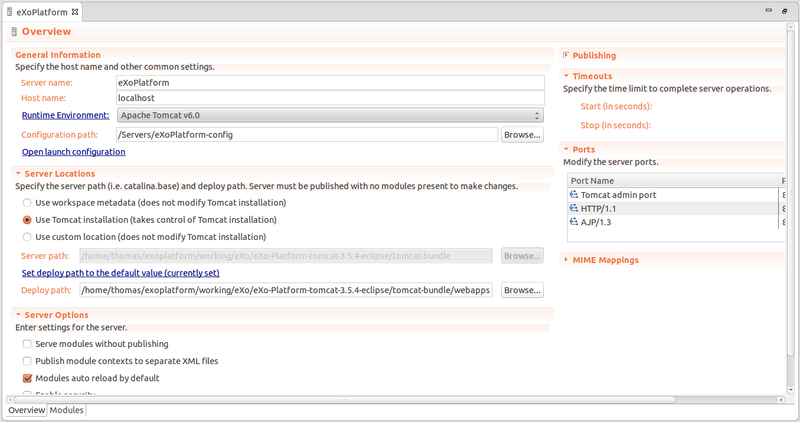 We will use the latest GateIn release (3.4), the tomcat bundle version. Once downloaded, install it by unzipping it in the location of your choice. The only thing you need to do is to drop the myapp.war file in the webapps folder, and start GateIn with bin/gatein.sh run. Great ! You just finished your first Juzu portlet ! Let’s explore the project before enhancing it. The mandatory web.xml is there. It does not contain anything. The portlet-class is the generic Juzu portlet class juzu.portlet.JuzuPortlet. dev : changes made on source files are automatically hot recompiled and reloaded, so you don’t need to redeploy your application to test them. This is a real productivity boost while developing an application ! prod : “classic” mode, where you need to recompile and redeploy your application to apply your changes. juzu.inject – defines the inject implementation. Two implementations are currently supported : weld (CDI Reference Implementation) and spring. 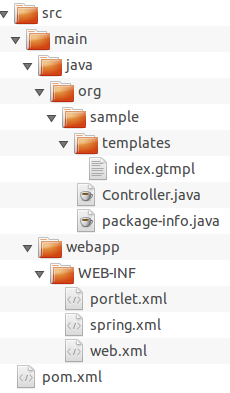 The Juzu portlet class uses the package-info.java file to gather needed extra information. 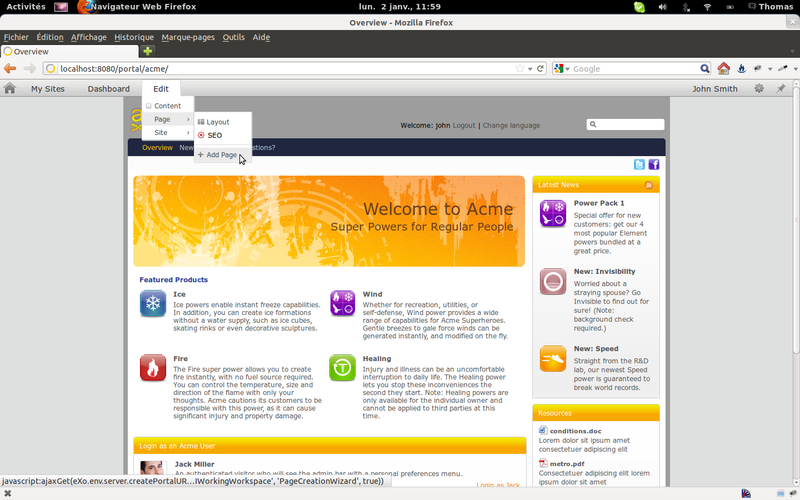 The portlet.xml file also contains basic information about the portlet : portlet-name, display-name and portlet-info. You can change them or add some others if needed. This file contains all the configuration of the application. The file allows to activate plugins, add JS/CSS resources, … but let’s keep it simple for now. The only mandatory configuration is the declaration of the application, thanks to the @juzu.Application annotation. You have to declare the base package of your application, in our case org.sample. This class is a Juzu controller. It is composed of a view method index (annotated with @View) which allows to render the index template. The path of the index template is set with the @Path annotation. By default, Juzu uses the templates package of the application as its root path. So in our case, the template is located at org/sample/templates/index.gtmpl. Now that we know a little bit more about what is a Juzu application, let’s improve a little bit our basic helloworld application. First of all, we will switch from prod to dev mode, in order to quickly test our changes. For that, edit your portlet.xml file and change the value of the init-param juzu.run_mode to dev. Then build your application and drop the war in the webapps folder of GateIn. Here you don’t need to stop/start GateIn as the webapp will be automatically redeployed. As we did not change anything in the source files of our application, you should see the same “Hello World” message in your portlet. and refresh your page once again. 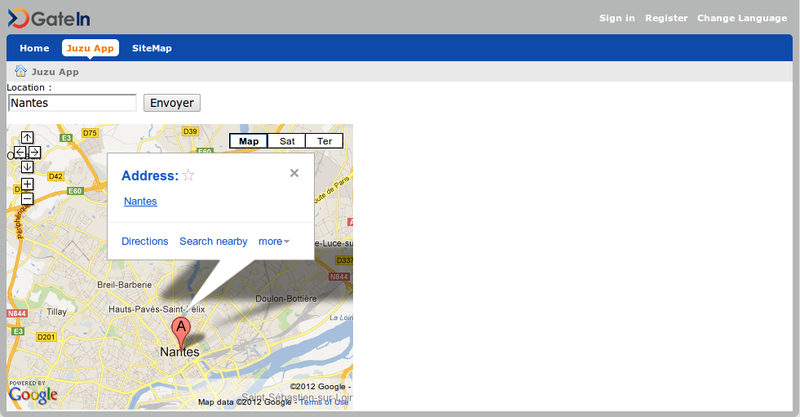 We will create an application which displays the map of the location choosen by the user. the index template is now of type org.sample.templates.index. This class is generated thanks to the annotations, and is a subclass of Template. Using this specific type will allow us to leverage declared template parameters, location and mapURL in our case. the default index View now calls a new index View which accepts the location and mapURL arguments. This new view uses the index template class and its fluent syntax (do you like it ? Personnaly I do ;)). Thanks to the declaration of the location and mapURL parameters in the template, the org.sample.templates.index template class accepts a location method and a mapURL method to set their values. the updateLocation method is defined as an action thanks to tthe @Action annotation. It is called by the form to retrieve the correct URL (building the map URL is a basic example, generally you will call your services here). Then it redirects to the index View method in order to render the index template. Note the _ at the end of the Controller name. The class Controller_ is the “annotations processed” version of the Controller class. Juzu provides some ease to use Ajax in your application. We will use them to avoid reloading our page when submitting a new location in our form. Note that this new method is not annotated with @Action anymore. Annotating a method with @Ajax will make it accessible for Ajax calls. The @Resource annotation makes this method send the entire response to the client. That’s what we want as this method simply creates the new URL and sends it back to the client as a JSON response. Then we just use JQuery to update the map. Once again, simply refresh your page to see it in action ! You can now learn more on Juzu by going to the website or watching the screencasts. 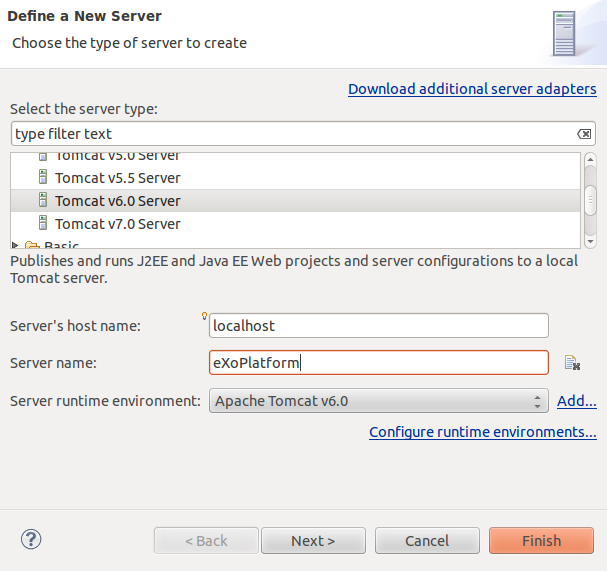 Download and unzip the latest version of eXo Platform 3.5 (Tomcat version). The eXoPlatform location will be referenced as <eXoPlatform_dir> in this tutorial. Download and install an Eclipse JEE bundle (I used Juno). Your eXoPlatform is now ready to be launched in Eclipse. In the Server view, you simply have to right-click on it, and click on Start. You can even create 2 instances of this server to easily switch between these 2 modes. 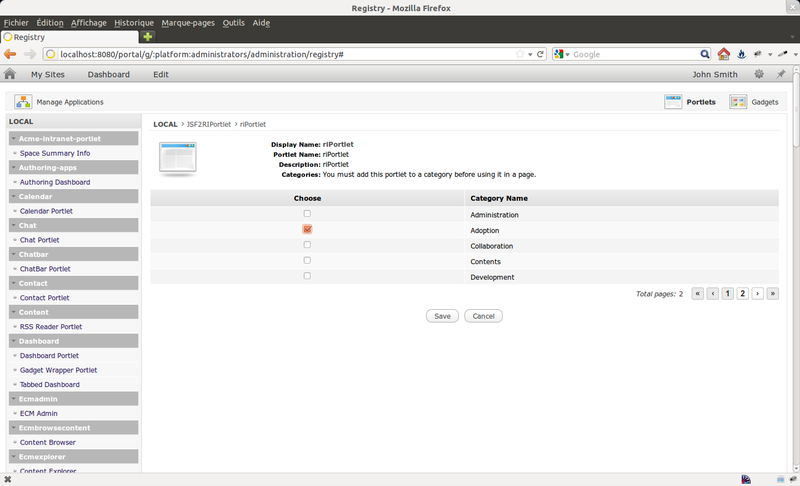 Fortunately, eXo ECMS allows to easily add your own file preview (and even modify the existing ones). Let’s do it with our ZIP file. The goal is to display the list of file’s names contained in the ZIP file. All the files that we will create have to be packaged in a JAR and added to the classpath. Here we only iterate on all the ZIP’s files in order to display thier names. Save it as ZipViewer.gtmpl and add it in the JAR in a folder templates. Once the view template ready, it has to be registered and linked to the ZIP file type. Note that this class defines the template’s path. In our case templates/ZipViewer.gtmpl. This configuration links the org.exoplatform.ecm.dms.ZipViewer component to the application/zip mimetype. One of the greatest strenghs of eXoPlatform is to integrate a lot of features together, such as content management and collaboration or social capabilities. After the development of a JSF 2 / RichFaces portlet, and the integration of the Content Management capabilities of eXoPlatform, we will learn, in this third tutorial, how to leverage eXo Social features in your own business portlets. For so, we will start from the portlet created in the previous tutorial and post an activity in the user’s activity stream when he buys a product. The source code of this tutorial is available here. // Gets the current container. // Gets identityManager to handle an identity operation. // Gets an existing social identity or creates a new one. // Gets activityManager to handle an activity operation. // Saves an activity by using ActivityManager. This service retrieves the current user’s identity and then post an activity for this identity with the given text. 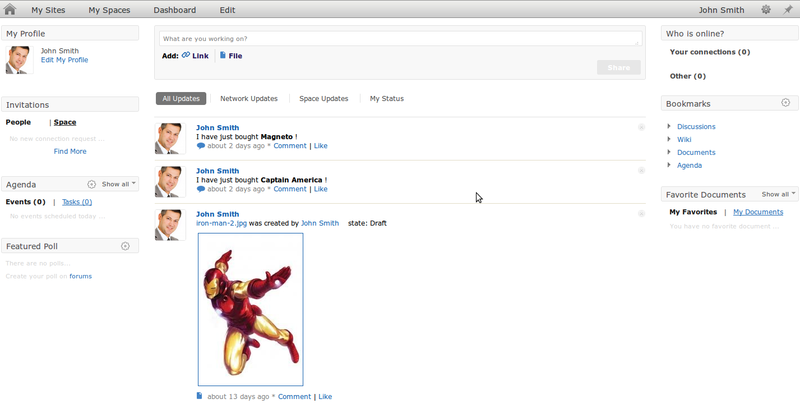 Besides this Java API, eXo Social offers a REST API and the OpenSocial API. In this tutorial, we learnt how to use the eXo Social API to post an activity from your own business portlet. Don’t hesitate to take a look at the documentation to discover all the available APIs. eXoPlatform comes with powerful content management features and a large set of portlets to use these features. However you may want to use these content management capabilities in your own portlets. This second tutorial will learn you how to use eXo Content Management API and portlets to create a sample store application. The first part about JSF / RichFaces integration is available here. This application will expose a list of products with related pictures. Each product will be composed of a name, a description, a price, a thumbnail and some pictures. The thumbnail and the related pictures will be retrieved from the eXo Content Management. 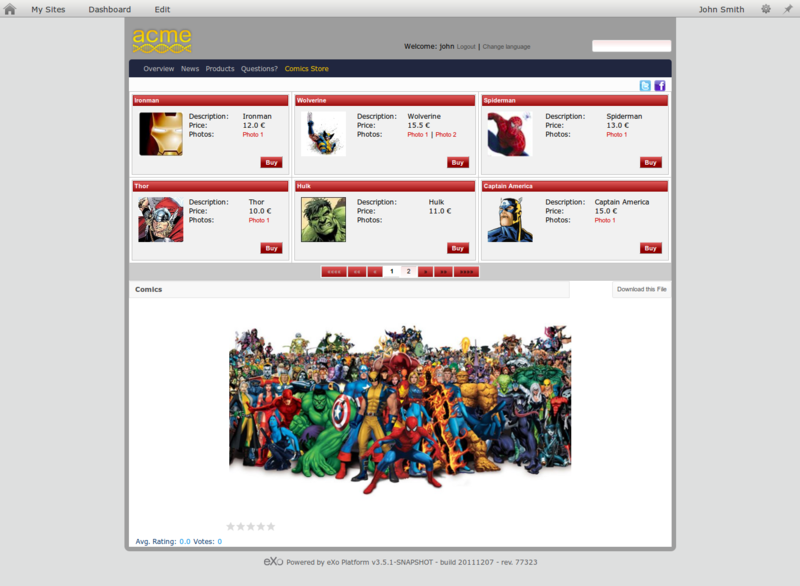 The page will display the product’s thumbnail and the product’s caracteristics. The related pictures will be available by links. 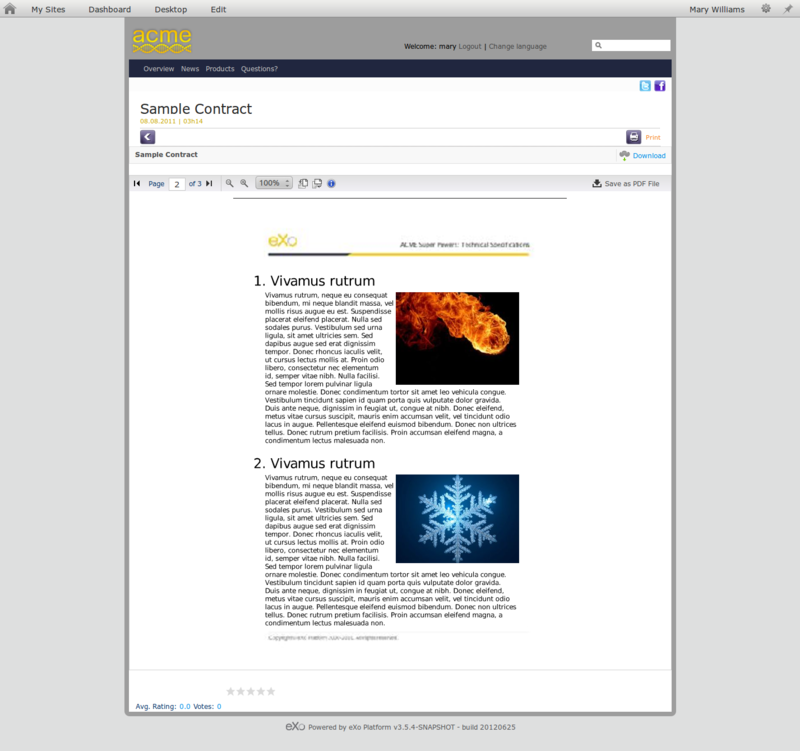 A Content Detail portlet will be used to display each related picture. To be sure that all contents are in published state, you may need to republish them. This bean instantiates 2 services : one for the products (ProductService), one for the contents (ContentService) which is initialized with the root folder in the content management system of the contents used in the store (retrieved from a portlet preference). Then the managed bean calls the ContentService object to retrieve the contents related to the products. Here is the most interesting part as it deals with eXo Content Management. ExoPlatform provides an API to interact with all content management capabilities (contents, taxonomy, links, publication, SEO, …). In our sample application we will use the WCMComposer API which allows to work with contents. This service is used in the 2 methods of ContentService : getProductThumbnailPath and getProductPictures. The getContent method of the WCMComposer API is used here. It allows to retrieve a content based on its path. Some filters can be added to select the right content base for instance on its language, its version or its publication state. We now use the getContents method, the equivalent of getContent but for multiple contents. One really interesting point is that by using this API you can profit from all the eXo Content Management features. For example, by calling the getContents method with the filter WCMComposer.FILTER_VERSION set to WCMComposer.BASE_VERSION and the filter WCMComposer.FILTER_MODE set to the current mode (live or edit), only the link of the published pictures will be visible in live mode whereas link of pictures in draft state will be visible in edit mode. In fact, a frozenNode is a published version of an original node. A frozenNode references the original node (in our case, the picture node) through its jcr:frozenUuid property. So we need to get this property to retrieve the original node and get its path. The ui:repeat lists all links towards the product’s pictures. The link simply goes to the same page (because a Content Detail portlet will be added in this page) and pass the content-id parameter with the path of the content to display. The Content Detail will just look at this parameter and display the targeted content. Our store is open ! The picture is now displayed below. The picture is now uploaded. Leave it in draft state and go back to the Comics store page. 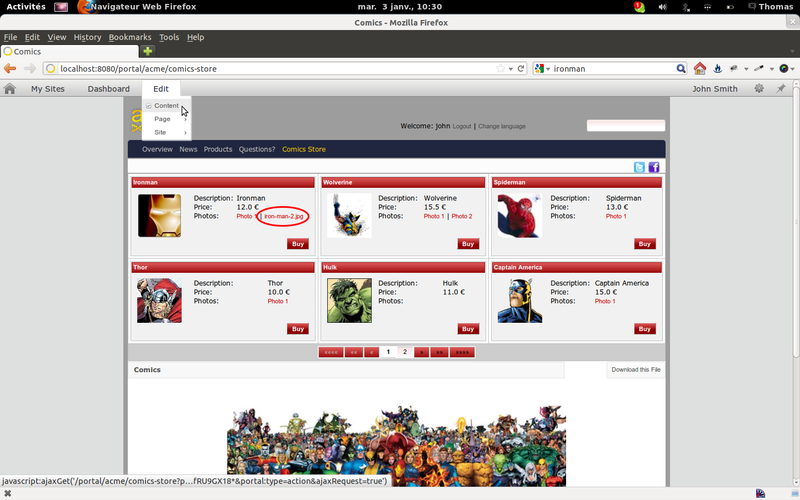 As you can see, your new picture does not appears in the Ironman’s pictures. Now switch to edit mode by clicking on Edit > Content. The picture link now appears and you can click it to display the new picture. Up to you now to publish it to make it available in live mode. This tutorial showed how to use the eXo Content Management API to profit from all the eXo Content Management features inside your own portlets. Don’t hesitate to take a look at the documentation to discover all the available APIs. Enjoy ! eXoPlatform comes with a set of advanced portlets to quickly build rich applications. But you may want to develop your own portlets to fit your needs. The development of portlet using the raw portlet API can be a bit painful. It is often interesting to use a higher level framework such as JSF. 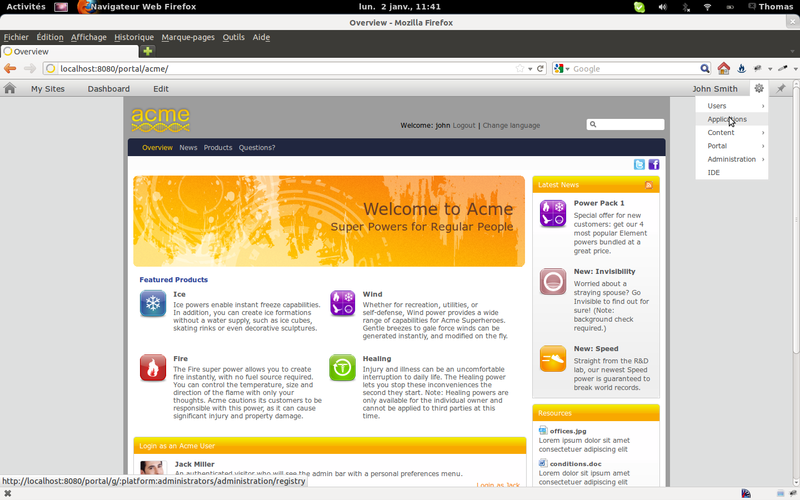 JSF is a request-driven MVC web framework based on component-driven UI design model, and is part of the JEE standard. This article is the first part of a 3-steps tutorials which will learn you how to develop a portlet with JSF 2.0 and RichFaces 4, and leverage eXo Content and eXo Social capabilities. RichFaces is a set a advanced JSF components which will allow us to add even more richness to our application. The source code of this first part is available here. 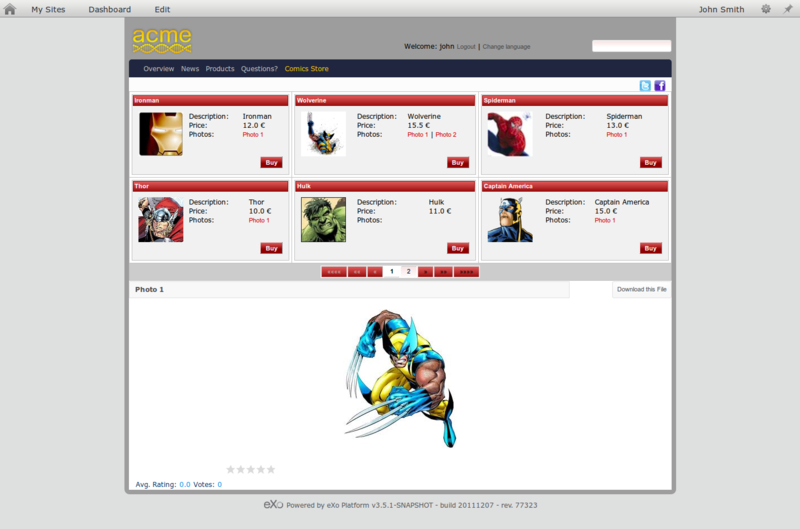 Download the latest version of eXo Platform 3.5. Install and configure Apache Maven. 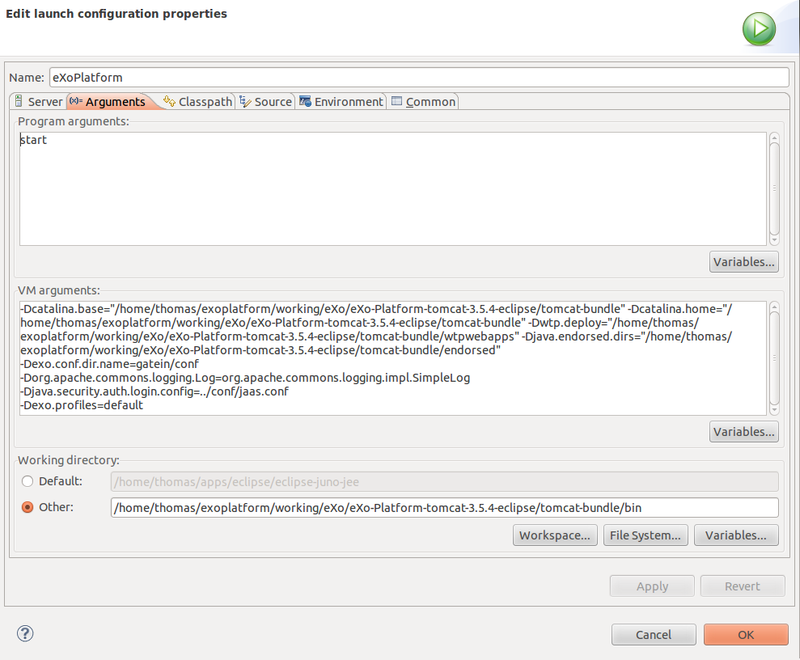 To be able to run a JSF application in a portal context, we need a JSF Portlet Bridge. This technology is also part of the JEE standard, and thus several implementations are available. For this tutorial the JBoss implementation will be used, but you don’t have to install anything as it will be added as a library in your portlet via maven. Maven will prompt you to change the default value of the project’s properties. You can leave the default values by simply pressing Enter. Your project is now created. However some little changes need to be done to make it fully operational. A war file should be available in the target folder of your project (JSF2RIPortlet.war by default). click on Portlets. The list of all the deployed portlets is available on the left side. We will now make the portlet addable in the portal’s pages. 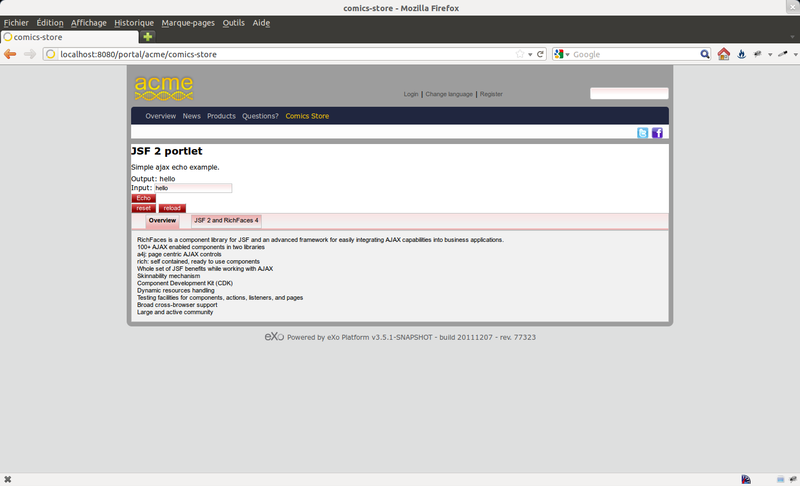 Select our portlet (RiPortlet in the JSF2RIPortlet category). in the right side, enter “comics-store” as the name and “Comics Store” as the display name (guess what this tutorial will deal with ? ;-)). Leave others fields as is. Note than you can easily define title in others languages. You can now use all the RichFaces components in your pages. Build your war and copy/paste it in the webapps directory of eXoPlatform. No need to restart, the portlet is hot redeployed ! 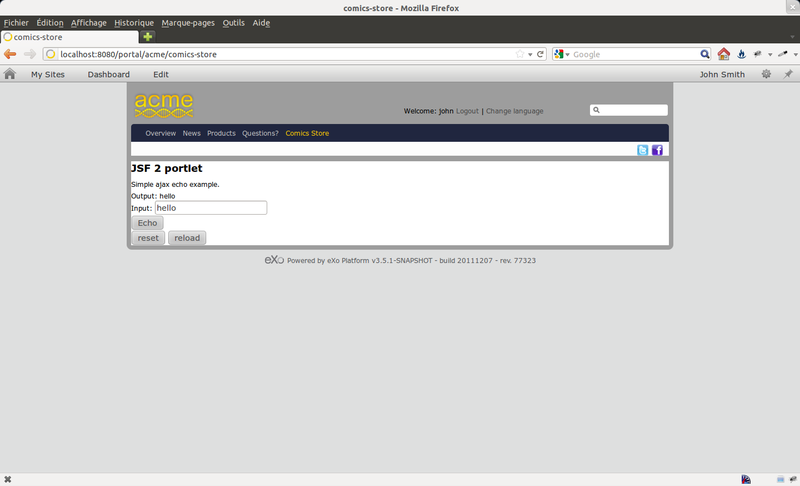 Your JSF/RichFaces Portlet is now fully working ! You can notice that the style of the elements on the page has changed. This is due to the skin capabilities of RichFaces. You can easily change the style by changing the value of the context param org.richfaces.skin in the web.xml (you have set ‘ruby’ for this example). RichFaces comes with a set of ready-to-use skins, and you can of course create your owns. This tutorial showed how to simply create your own portlets using JSF, a standard java web framework. The next tutorials will show how to leverage eXoPlatform features in your business portlets. REST Services in GateIn / eXoPlatform : add your own ! Mulitple REST services are available out of the box in GateIn / eXoPlatform. They allow to easily interact with the platform’s features and data. Here we will see how to quickly add your own REST services (valid for eXoPlatform 3.0 or 3.5). As you can see, this class uses standard JAX-RS annotations to expose its services (javax.ws.rs.*). The only thing to add is the org.exoplatform.services.rest.resource.ResourceContainer interface. This interface is a marker to define this class as a REST services class. Adjust the dependency version according to your Gatein / eXoPlatform version. This configuration can be put either in the jar containing the java class (in conf/portal/configuration.xml), or in an extension, or even in the external configuration. Now you just have to deploy your class and your configuration (for example, put the jar containing the class and the configuration in the tomcat’s libs), and restart the server. Up to you now to implement your custom REST service !